Entrepreneurship can be a lonely journey. Many of us start businesses on our own without the help of partners, mentors, instructors or teachers and we fight our own way through the hustle and grind that it takes to get a business up and running. Everyone who’s started their own business knows that it’s not easy, and when you’re pursuing the journey alone it can seem even more difficult because you may not have connections to reach out to, mentors to guide you and other entrepreneurs to share experiences with. It’s hard to start something and it’s hard to even know what it takes to build a business when you’ve never built one before or when you think you’re not ready. Take us for example: we’ve literally started from the bottom and grown into where we are now, what we like to call A Better, Better Lemonade Stand. We get it. If you’re signed up to our weekly email newsletter you may recall that we sent out our annual survey a few weeks ago to get some general feedback and further insight into our audience. Since hundreds of you responded, we thought we’d share some of our findings so we can all get a glimpse into other people’s journeys and see where we’re all at. With these insights you can get a glimpse into what others are doing, what they’re focusing their time and money into and just some general insight into what the entrepreneurs around you are up to. It can be difficult to measure progress when you have nothing to compare it to, so we thought this information could serve as a realistic benchmark for how others are getting through their hustle. It’s true that entrepreneurship can be lonely but when you go through the information in this post you’ll be able to recognize that you’re not alone: other entrepreneurs have struggles, other entrepreneurs are hustling and grinding too. Other entrepreneurs are bootstrapping their business, growing their business, building their revenue streams, implementing new systems or haven’t even started yet but want to start. You’re not alone, and we hope this post can help demonstrate that and create some realistic measurements for you to benchmark your own progress against whether you’re at the stage of building, launching or growing your own ecommerce business. Let’s jump into it. It’s true that entrepreneurship can be lonely but when you go through the information in this post you’ll be able to recognize that you’re not alone: other entrepreneurs have struggles, other entrepreneurs are hustling and grinding too. 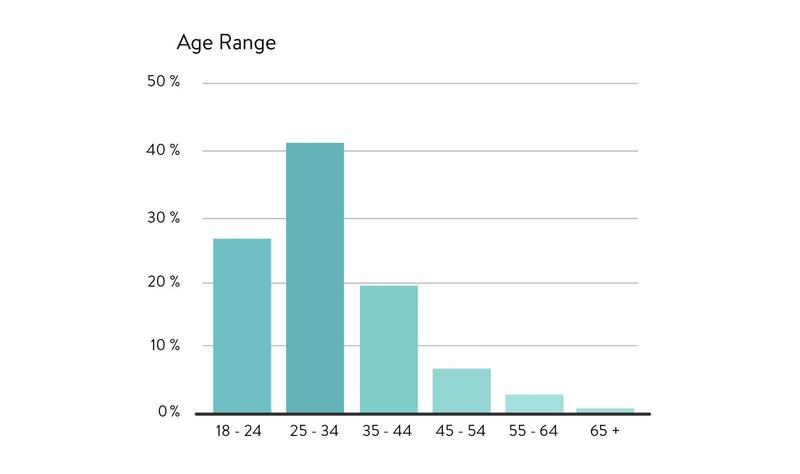 As you can see, over 40% of our audience is between the ages of 25-34, and just under 30% of our audience is between the ages of 18-24. Collectively that means that almost 70% of our audience is between the ages of 18-34, meaning our content and resources are getting consumed by the part of the population that’s likely just starting, building and developing their lifelong careers. We’ve discussed before why entrepreneurship is so important, especially now that jobs, even specialized ones, are becoming more and more automated, so it’s reassuring to see that the demographic of individuals whose job security is under the biggest threat is the most interested and engaged in learning more about entrepreneurship – which is likely going to be an important skill going forward in the decades to come. Our audience is divided into a 60/40 split of men and women who consume our content. We expect and hope that this divide may even out to an equal 50/50 split in the coming years. 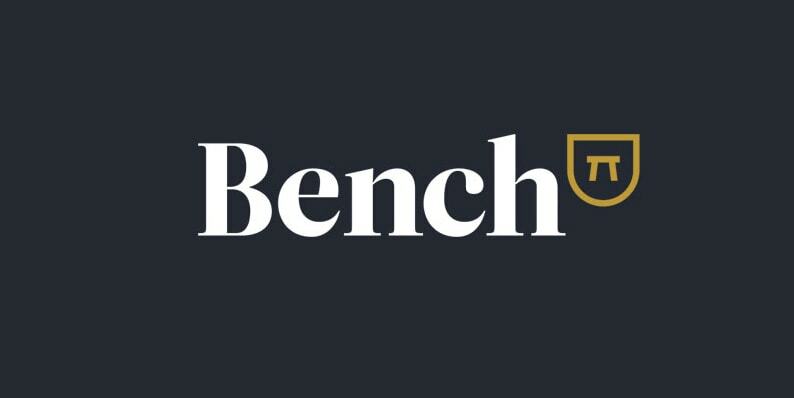 As expected, the vast majority of our monthly visitors are located in the United States and no surprise that the majority of our monthly readers comes from predominantly English speaking countries, as our website is targeted to English speakers and Western business models and practices. The results of this question were a happy surprise for us as the amount of our audience members who currently have an ecommerce business since our last annual survey has nearly doubled. Our goal with A Better Lemonade Stand is to encourage our audience members to start their own ecommerce business – whether it’s just a side hustle or to fully replace their day job – by providing practical and actionable advice, tools and resources to help them build, launch and grow their own business. The difference between last year’s result (20% of our surveyed audience members currently had their own ecommerce business) to this year’s, shows us that either directly or indirectly we may be achieving our goal and helping our audience members to start their own businesses. We hope that this percentage continues to rise. If you’ve actually never started your own business it can be tough to gauge exactly how much it costs to start up a business. Sure, you can learn from others who have done it before you but depending on the type of business model you want to pursue (making, manufacturing, wholesaling or dropshipping), your product type (physical goods, digital goods, etc) and many other factors, the cost of starting a business varies from entrepreneur to entrepreneur. These metrics from our audience can give you a realistic insight into what to expect when starting your own ecommerce business. 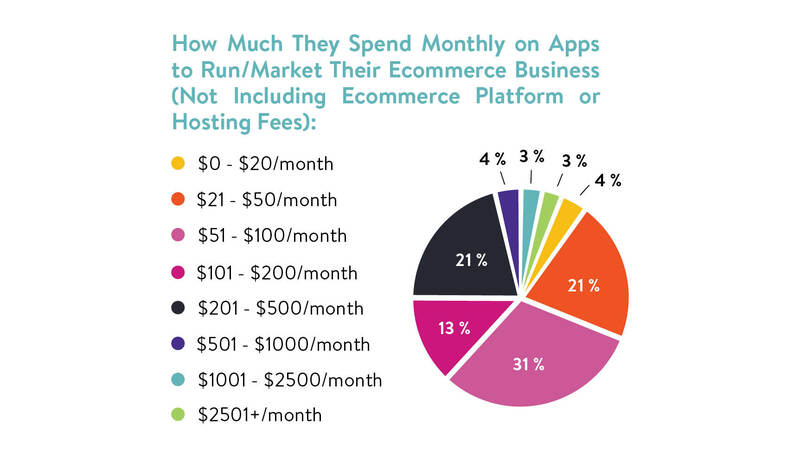 As you can see, the majority of our audience had a budget between $100-$500 to start their ecommerce business. Then next most common budget range is $2501-$5000. Depending on the type of business you want to create and the choices you make when it comes to actually acquiring product and setting up your business, you can see here that’s it’s possible to start a business no matter what kind of budget you have to work with. Since the majority of our audience members, 47% to be exact, currently have a business that’s within 1-5 years old and 36% have a business that’s less than a year old, this provides a good indication of what new ecommerce stores can expect to be making in their first 5 years of business. Keep this in mind if you’re just building your business and want to know what to expect revenue-wise when it comes to your first few years of business. Unsurprisingly, the majority of our audience runs their ecommerce store through Shopify. It’s no secret that we think Shopify is the best ecommerce platform out there (if you still need more convincing check out our Shopify Review) so we’re delighted to see that most of our audience agrees. As for the 28% making up the “Other” category, that’s comprised mostly of Amazon, Etsy and some eBay sellers. Again, not surprising that a portion of our audience chooses to sell on those marketplaces as they can be a lucrative option and a good option for getting traffic. We’re happy to report that 80% of our audience is passionate about the products they sell and the market they serve. While it isn’t completely necessary to sell a product or serve a market you’re passionate, you can certainly be successful even if you’re not, it’s helpful to be passionate about what you’re selling and who you’re selling it to. Just like entrepreneurship can be lonely, it can also be difficult, and when you’re slogging through months of low traffic, no conversions and high abandoned cart rates it can be easy to give up. One of the main reasons entrepreneurs don’t give up is that they’re selling a product they’re passionate about that they want to share with others, or they have a target market who they’re close with. You’re also more likely to know where to find your target customers and how to speak to them if you’re also passionate about it yourself. It’s not necessary, but it’s helpful. As you can see, the general consensus is virtually the same! Location independence, financial prosperity and creating a product/brand remains at the top of the list for both parties. These metrics give good insight into how much it costs to upkeep a business – besides general overhead such as ecommerce platform/hosting subscriptions – every month. When starting a business you have to take into consideration how much the actual startup costs will be, but some of those costs will just be one time purchases (like your domain might be, for example, or your logo). Other features, however, might cost you a recurring payment monthly that you’ll have to factor into your running costs. Just like brick-and-mortar businesses need to pay monthly bills to keep the lights on and the water running at their business, you’ll probably need to pay some monthly “bills” as well to keep your business functioning in optimal condition. These fees could include your business email hosting fee, the cost of something such as Adobe Creative Cloud which you may use to design your website’s images or graphics, maybe it includes the apps you use to add additional features such as recurring payments or monthly subscriptions to your store, etc. Just whatever essential services are needed to help your business run month-to-month. When it comes to advertising, 30% of our audience spends $0 on paid advertising per month. Yep, you read that right. Zero dollars. This demonstrates to us that our audience is utilizing non paid advertising channels such as SEO and social media platforms over paid options. Since 18% of our audience informed us that SEO is their most effective sales/advertising channel and 16% say organic social media is most effective for their store, this helps back up our theory. It’s also worth mentioning that since the majority of our audience’s businesses are less than 5 years old, it’s possible that many businesses don’t have a budget to spend on paid advertising and choose unpaid options in an effort to manage their finances more efficiently. Unpaid options like SEO and social platforms can bring in lots of traffic when used consistently, so it’s not a bad option for stores who are working on a bootstrapped budget. 17% use other advertising methods which mainly include referrals and word of mouth. Lastly, it’s important for us to know where our audience’s struggle spots are so we can continue to create content and share tools and resources to help entrepreneurs work through these trouble areas. 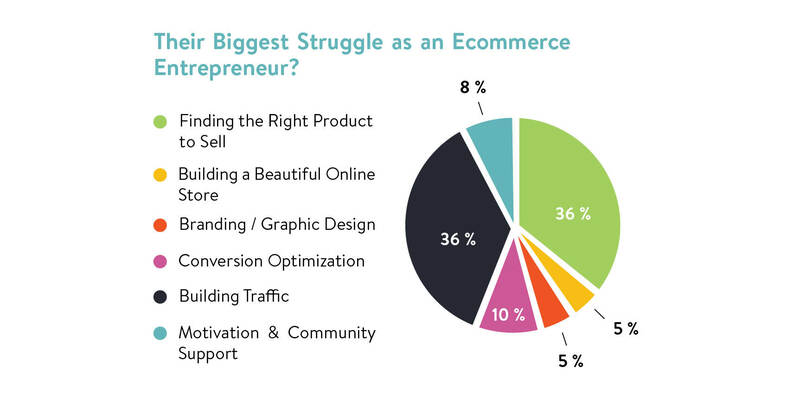 Finding the right product to sell is always one of the biggest struggles for individuals who are looking to start their first business, and as you can see in the above chart it’s one of the biggest struggles that our audience deals with. Also one of the biggest struggles our audience deals with is how to build traffic. Again, this is another common problem that new entrepreneurs go through when they’ve just put their first ecommerce store live because as all entrepreneurs have learned, and as the old adage goes, just because you build it does not mean they will come. And finally, the third biggest struggle our audience faces is conversion optimization – essentially, once you start gaining some traffic, how do you turn that traffic into customers. If you haven’t started a business yet but you want to, you likely fall into one, or all, of these categories. This is normal when first starting your business. So few people have a clear cut idea of what kind of business they want to start, and even fewer have the exact know-how to start up a business immediately without any trial and error. Because that’s what it’s going to take, trial and error. There are so many resources and tools out there that can help you develop product ideas and knowledge about business, us being one of them but also the Shopify Blog, Skillshare, Bench Accounting Syllabus, Indie Hackers, Sumo’s Blog, Ahrefs Blog and more, so if you’re one of the individuals who make up any part of those percentages above where lack of knowledge and product ideas are holding you back, make use of the resources available to you online to start bridging that gap and developing your skills. No entrepreneur started out knowing everything, and many entrepreneurs built, launched and grew successful businesses when there weren’t so many valuable online resources to help them get started, so if they can do it, you certainly can, too. You’re not alone. You’re not the first entrepreneur to start their own ecommerce business and be faced with the accompanying struggles, and you certainly won’t be the last. You might feel like you’re alone in your struggles and like your the only entrepreneur that you know of who’s out there hustling every day, but as you can hopefully see by the data in this post that you certainly are not. We hope these metrics have given you insight into where other people are at so you can use it as a benchmark to realistically measure your expectations for yourself no matter where you are in the process of building, launching or growing your ecommerce business. Richard Lazazzera is an ecommerce entrepreneur, former Shopify Growth Team Strategist, and founder of A Better Lemonade Stand. Learn more about Richard or get more from him on Twitter. Thanks for posting these results Richard. I feel like the low barrier to entry in eCommerce is both a blessing and a curse. Having less than $500 to start with, a lack of knowledge and product niche direction isn’t a strong start. But there is passion, which can carry things a long way. Definitely agree that it’s worth taking the risk in today’s market though. Own your time or someone else will! It would be interesting to see any relationships between the lower end Shopify merchants that started with less than $500, spend less than $200 in marketing each month and still find a way to grow each year.